Equality – a goal that keeps getting out of our reach. We get close then whoops it’s out of range again. I thought this after watching the documentary Equal Means Equal. Its message and I paraphrase this: “women do not match men in society.” For example, women earn less than men in the workplace. Another example is not treating the abuse and assault of a woman the same as if it happens to a man. And there are more improvements we could have. No longer judging another person based on skin color. Make it so a woman can feel good about becoming pregnant and taking maternity leave from workplace with HR and or management support. No longer looking down on someone who is physically or mentally disabled. Etc. Etc. Instead of legislating separate fixes for each issue separately, legislation needs be more encompassing but not too broad. 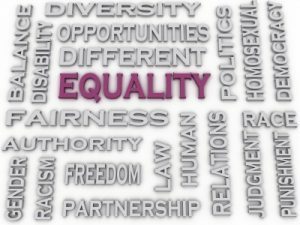 A good starting point is passing and ratifying the Equal Rights Act or ERA. We have come a long way globally but we are not done chipping away at the prejudices that exist. Numerous organizations will keep fighting for rights of various people and groups. I know it is impossible to get rid of all the prejudices but we can strive to lessen its power as much as we can.